It might seem obvious to many that, when it comes to wine, style and quality are two distinctively separate concepts. Yet, many wine critics and bloggers still confound these issues as if they are one and the same. Until now, this column has begged to differ. The fortified wines category is a case in point. Some might argue, for example, that Vintage Port is a higher quality wine than Tawny Port. However, stating so is misunderstanding the essence of each wine for the simple reason that each is made with a different drinking intent. The style of one, its personality, is completely different than that of the other. Therefore, their measure of excellence, their quality, must be assessed individually and on their own. 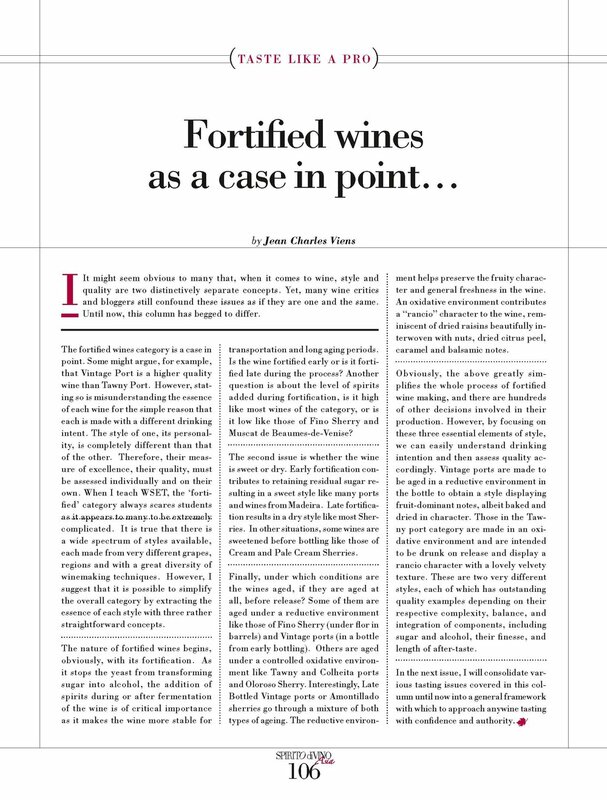 When I teach WSET, the ‘fortified’ category always scares students as it appears to many to be extremely complicated. It is true that there is a wide spectrum of styles available, each made from very different grapes, regions and with a great diversity of winemaking techniques. However, I suggest that it is possible to simplify the overall category by extracting the essence of each style with three rather straightforward concepts. The nature of fortified wines begins, obviously, with its fortification. As it stops the yeast from transforming sugar into alcohol, the addition of spirits during or after fermentation of the wine is of critical importance as it makes the wine more stable for transportation and long aging periods. Is the wine fortified early or is it fortified late during the process? Another question is about the level of spirits added during fortification, is it high like most wines of the category, or is it low like those of Fino Sherry and Muscat de Beaumes-de-Venise? The second issue is whether the wine is sweet or dry. Early fortification contributes to retaining residual sugar resulting in a sweet style like many ports and wines from Madeira. Late fortification results in a dry style like most Sherries. In other situations, some wines are sweetened before bottling like those of Cream and Pale Cream Sherries. Finally, under which conditions are the wines aged, if they are aged at all, before release? Some of them are aged under a reductive environment like those of Fino Sherry (under flor in barrels) and Vintage ports (in a bottle from early bottling). Others are aged under a controlled oxidative environment like Tawny and Colheita ports and Oloroso Sherry. Interestingly, Late Bottled Vintage ports or Amontillado sherries go through a mixture of both types of ageing. The reductive environment helps preserve the fruity character and general freshness in the wine. An oxidative environment contributes a “rancio” character to the wine, reminiscent of dried raisins beautifully interwoven with nuts, dried citrus peel, caramel and balsamic notes. Obviously, the above greatly simplifies the whole process of fortified wine making, and there are hundreds of other decisions involved in their production. However, by focusing on these three essential elements of style, we can easily understand drinking intention and then assess quality accordingly. Vintage ports are made to be aged in a reductive environment in the bottle to obtain a style displaying fruit-dominant notes, albeit baked and dried in character. Those in the Tawny port category are made in an oxidative environment and are intended to be drunk on release and display a rancio character with a lovely velvety texture. These are two very different styles, each of which has outstanding quality examples depending on their respective complexity, balance, and integration of components, including sugar and alcohol, their finesse, and length of after-taste. 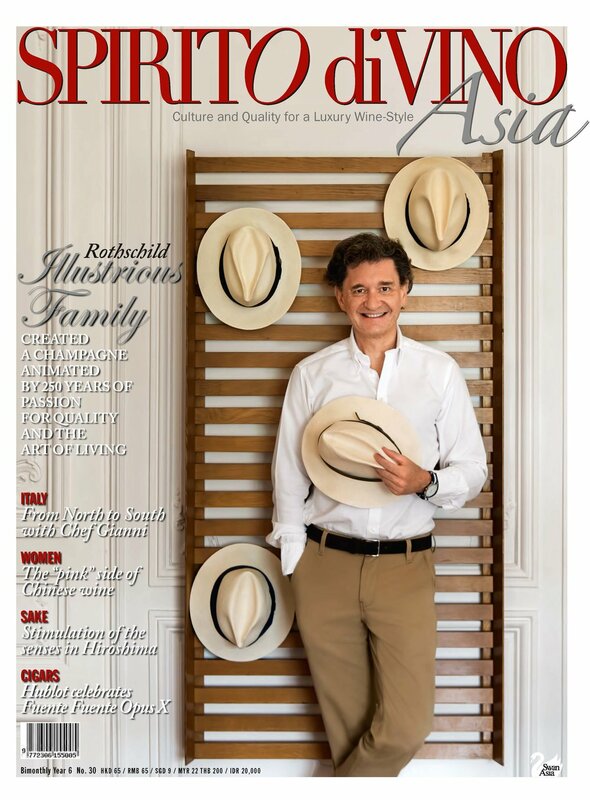 In the next issue, I will consolidate various tasting issues covered in this column until now into a general framework with which to approach any wine tasting with confidence and aut confidence and authority.